In the preliminary considerations of the Code of Ethics of the University of Cádiz, known as the “Peñalver Code”, a wide range of values and proposals are summarized, and there is a special emphasis on respect for the recognition of diversity, the respect that is wanted to the environment and the feeling of belonging to a project. All these aspects prefigure what will later be the concept of Social Responsibility. University Social Responsibility details a new way of functioning of the university, a new mode of training and behavior based on a more fluid and direct relationship between the university and its social environment, for which the effects, repercussions and expectations are taken into consideration that the activity of the university generates both in the members of the university community itself and in society. That is why, in order to improve the perception that society has of the university and its library, this one, in addition to strictly complying with current legislation on labor and tax matters, safety and the environment, and being sensitive to energy savings and recycling of materials, must be involved and show commitment to society through participation in charitable, leisure or cultural activities, either economically or by giving up their premises or resources. You can do it, also through activities related to training: visits to your facilities, lectures or talks by your staff in institutes or organizations, etc. Therefore, the university and its library must be conceived as a place of meeting, debate and coexistence of the university community and its environment for the development of democratic culture and as a center of proposals where free and critical citizens are formed. 5.3 Contribute to social and humanistic development with the knowledge generated in the University. 8.1 Promote the participation of students and our graduates in the University. 9.1 Reinforce the integral formation of the students. Under this idea and diverse areas, in a coordinated manner and from an integral and global perspective, the Library, Archive and Publications Area of the UCA has elaborated its strategic planning with a view to the European Higher Education Area (EHEA), in which promotes a series of improvements in the educational systems of the European Union states. As part of this strategic planning, specifically within the operational objectives of strategic line 4, is the University Plan for the Promotion of Books, Reading and Writing, with which we want to address a set of programs and activities aimed at all the students, regardless of their age and the lessons they teach, and all the teachers and the rest of the university community, as well as society in general.
. Development and dynamization of reading competence.
. Development and dynamization of the proper management of written composition.
. Recognition and promotion of literary and research work carried out by members of the university community of the UCA.
. Settlement of the UCA Library as a space for reading and promoting books, reading and writing.
. Promotion and revitalization of the Library of the UCA, its bibliographic collection and services. Through the University Plan for the Promotion of Books, Reading and Writing, we intend to explore a comprehensive solution to increase reading habits and increase reading comprehension, seeking to strengthen all efforts in order to facilitate access to readings; of recognition and promotion to the author and his work; to stimulate literary creation, generating experiences in readings and writings, as well as preserve and value the bibliographic heritage. In order to promote the literary creation of the students of our University, the Vice-rectorate for Social Responsibility, Cultural Extension and Services of the UCA, through the Library, Archive and Publications Area with the collaboration of the Social Council of the UCA, convenes the Brief Narrative Literary Contest “UCA Library”. With this contest seeks to establish a space of expression and creativity for students of the University of Cádiz. The winning stories are compiled in a book that will be published by the UCA Publishing House and will be part of the “Welcome Book” collection, which, in turn, is another of the programs that are part of the plan and with it will be given to all new students entering the University of Cádiz, at the beginning of each academic year. Precisely, the call for this Short Narrative Literary Contest opens with the opening of the new academic year. The Awards of the Competition are sponsored by an approved supplier company of the Library, Archive and Publications Area. Establish a space of expression and creativity for the students of the University of Cádiz. Promote the fondness for writing and literary skills among students of the University of Cádiz. Transmit experiences about academic activity and university studies, through the library, literature and books. Promote the role of the university library through the narrative and the recreation of university experiences. Give new students with a book as symbology of the relationship that, from their entry and access to the University, they will maintain in their academic and professional life, with the book and the library. Encourage students to read and move the importance of books and the library as a fundamental tool for their education and learning. This activity promotes the delivery of books not entered or removed from the bibliographic collection of the UCA Library and aims to raise awareness among the university community of the UCA about the value and the permanent usefulness of the book. On the one hand, the Library of the UCA and the Publications Service of the UCA make available to the university community those books withdrawn from their funds, as well as those from donations not entered in the bibliographic fon.do of the Library of the UCA, in accordance with current legislation on expurgation and donations. On the other hand, the Collection and Heritage Working Group with the collaboration of the libraries’ management and staff coordinates with the university community (students, teachers and PAS) the collection of those manuals and complementary books of their studies that no longer they are needed for the degree or research work they are doing with the purpose of making them available later to other students who may need them. Promote the donation of new or used books among the university community of the UCA. To value, through the campaign “THIS BOOK IS FOR YOU”, books and documents not entered or removed from the bibliographic collection of the Library of the UCA in accordance with the current rules of expurgation and donations. Make donation available, through the UCA Library for the campaign “THIS BOOK IS FOR YOU”, all books derived from the purges made by the Publications Service of the UCA. Presentation of books by writers linked to the University Community of the UCA and its social environment. With this program, the Vice-Chancellor of Social Responsibility wants to promote among the members of the university community who have written and edited a book to present it and disseminate it within the Institution and make it public for the society of Cádiz in general, as well as its insertion in the bibliographic collection of the UCA Library. Make known literary works and documents of academic interest written by members of the university community of the UCA. Publicly acknowledge and promote the literary and research work done by the author. Connect the author and his work with the university community. Encourage the art of writing among the members of the university community. The Free Books program – Bookcrossing is the practice of leaving books in public places to be collected by other readers, after the same. The idea is to stop traveling freely to books so they can be found by other people. Under these premises, from the Vice-rectorate of Social Responsibility and University Services with the collaboration of the Area of Library, Archive and Publications of the UCA we have launched this initiative in order to help promote reading: Free Books – Bookcrossing. For this we have adhered to the international initiative “Bookcrossing”, which in a very summarized way consists of leaving books available to any user and that, once read, leave it to continue to reach new people. In short, it is about fostering the culture of enjoyment over possession. Bookcrossing or BC is an initiative that begins in March 2001 in the United States. It is an international movement that aims to turn the world into a global library. It basically consists of a global Book Club that crosses time and space, that knows no geographical limits and whose goal, simply, is to turn the world into a Library. Introduce and involve the members of the University of Cádiz in Free Books – Bookcrossing. Convert the Library of the UCA into official zone Free Books – Bookcrossing. Transform the world into a global library. The International Book Day is a commemoration celebrated worldwide with the aim of promoting reading, the publishing industry and the protection of intellectual property through copyright. At an international level, it is promulgated by UNESCO, which did so for the first time in 1995, although its origin dates back to 1930. On April 23 it was chosen as International Book Day, due to the coincidence with the death of Miguel de Cervantes, William Shakespeare and the Inca Garcilaso de la Vega on the same date in the year 1616. For this reason, this date so symbolic for universal literature was chosen by the General Conference of UNESCO to pay a worldwide tribute to the book and its authors , and to encourage everyone, especially the youngest ones, to discover the pleasure of reading and to respect the irreplaceable contribution of creators to social and cultural progress. Each of the editions of the University Book Week will be dedicated to a writer from Cádiz, who will be paid a tribute and institutional recognition for his literary work and professional career. Develop creativity, instill values, as well as promote the value of books and discover the pleasure of reading among the university community. Promote activities within the UCA around the book to commemorate the International Book Day. 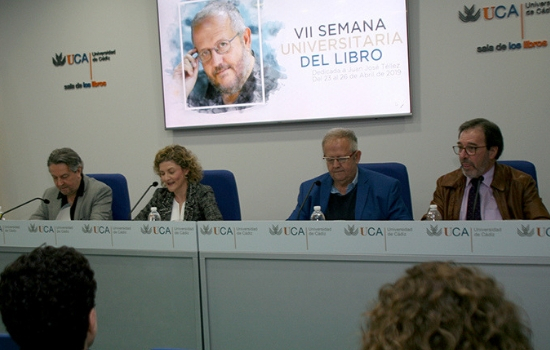 Dedicate the University Book Week annually to a writer from Cádiz. Make a public recognition from the University of Cádiz. Pay a worldwide tribute to the book and all the authors. Protect and recognize the contribution of creators to social and cultural progress. Show and value of the historical collection and bibliographic and documentary heritage of the UCA. This program aims to rescue and value the works of the historical collection of the University of Cádiz, rescuing them from oblivion and making them known to their community and society in general. For its realization from the Collection and Heritage Working Group, people from the university community and its academic environment are encouraged to re-read or read for the first time works that were published long ago, rediscover stories, investigations, images, documents, writings… and to value its importance and transcendence in the studies, teaching and research of its time and the validity of its content in the current academic formation. Oblivion is imposed in the university libraries because new ideas arise every day and new editions are published that follow the previous ones. That is why, for the maintenance of the bibliographic collections, a conservation work that is quite unknown and little valued is carried out. Through exhibitions and public presentations of works, on the one hand, and the restoration of works from the historical collection, on the other, this important bibliographic heritage of the University of Cádiz is disseminated, recovered and put into value. Show and value the Historical Collection and the old fund of the University of Cádiz. Disseminate works of bibliographic and documentary heritage with which the UCA has. Recuperar y restaurar obras de la colección histórica y fondo antiguo de la UCA. Re-read old books, get to know their authors and make their work known again by revitalizing a find. Value the content of the work, its importance and importance in the studies, teaching and research of its time and the validity of its content in the current academic formation. The Welcome Book is the final result of the Brief Narrative Literary Contest of the University Library of Cádiz, which seeks to promote literary creation among university students and establish a space for expression and creativity within the University of Cádiz. Each year, the winning works are compiled in a book published by the Publications Service of the UCA and are part of the “Welcome Book” collection with which new students are given a gift to promote the habit of reading and how symbology of the relationship that, from their entry into the University, they will maintain in their academic and professional life, with the book and the library. Present the new students with a book as a symbol of the relationship that, from their entry and access to the University of Cádiz, they will maintain in their academic and professional life, with the book and the library. Promote the habit of reading and transfer the importance of the book and the library as a fundamental instrument for their training and learning.